1973 Established ken shing industrial shop. 1976 Successfully developed manufacturing technique of reel type terminals. 1978 Renamed Ken Sing Industrial shop to be K.S. Terminals Inc.
1981 Start producing non-insulated and pre-insulated copper wire terminal. 1983 Develop terminal assembly machine by oneself. 1984 Start producing tape on reel per-insulated terminals and crimping machine. 1985 Enlarge plant area 900 square meters. 1986 Set up K.S. Terminals Inc. 2nd factory, enlarge plant area 1,000 square meters, to develop new manufacturing technique of punching tools. 1993 Continue to enlarge plant area 2,000 square meters, set up finished and semi-finished goods warehouse, implement quality managing system. 1994 Implement 1st set AS/RS automatic stocking system and intergrate with MIS system, also implement ISO QA system. 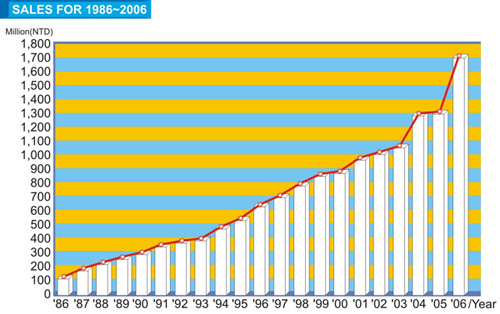 1995 Start producing European and German standard terminals, ISO 9002 Assessment passed in Dec. at the same year. 1996 In Jan. offically got ISO 9002 certification from SGS, and purchased 20,000 square meters land in chang Pin Industrial Park. 1997 Start to construct 20,000 square meters new factory in Chang Pin Industrial Park. 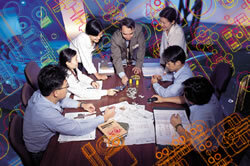 implement rationalization ,standardization, automation ,up grade quality, self-challenge to gain JIS certification. 1998 Implement 6 sets AS/RS automatic stocking system, Accomplish factory construction. New Factory completed and moved in new factory completely in July, reorganize K.S.Terminals Inc., set up and running 1st business group in Chang Pin Industrial Park, also re-set 2nd factory to be 2nd bussiness group. 2001 Set up 3rd Business Group,and Plating shop. Extending new product line as new electronic ceramic ,ceramic lamp socket ,aggressively developing markets of 3C &optical telecommunication components. 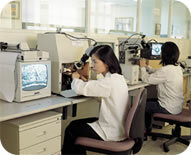 2002 In Jan. renew quality system to be ISO 9001 (2000YR version) certification, on Feb. 19th. KST stock officially traded in Taiwan stock market. 2004 Renew and upqrade ERP computer system on Jan gainning ISO 14001 certification. 2005 In April, Set up joint venture company "Green Point Precision Components Co., Ltd." together with "Taiwan Green Point Enterprises Co., Ltd.", in July set up Taipei Business Group to develope IT/IA/IO connectors. 2006 2006 ISO TS16949 assesment in July and gainning official certification in Dec.
only gained customer's recognition, but also passed the ISO 9001,14001, JIS, ISO TS16949, quality system certification. In order to achieve much higher quality, KST has introduced the most advanced checking instruments, set up the best equipped laboratory, through all kind of precise test and inspection, to ensure the products quality and specification. But we are not satisfied with those, we also have asked all member's attending, take full power to promote "QCC" quality circle activities, and "Proposal Improving System", continue to improve, and to up grade quality, enable ourself to react on more severe different quality system, to be certified by various safety regulation from all world wide countries such as: UL, C-UL, CSA, DNV.....etc. Research Developing Dep. is responsible for making company's long & middle term developing schedule, including new product research, production techniques evaluation, studying & implementing, also aggressively to breed R & D talent, by using AUTO CAD, Pro-Engineer, Uni-Graphic CAD/CAM aid system, to promote design and manufacturing techniques of product, mold, tooling jigs, on line check instrument and ASSY machines.......etc. KST recently based on the present kernel technique to develop new products, such as : automotive terminal & connector, for cell phone, lighting system accessories, precision ceramic processing, precision processing of Titanium thin shell products for 4C, to develop precision componets for 4C, semiconductor and optical fiber in dustry, agressively developing automotive & house appliance strip terminals & connectors, 4C IT/IA/IO fine pitch precision connector. KST intends to promote own-production capability of mold, tooling, jigs...etc. We have established a Tool Shop, introducing all kinds of high class & precision machine tools from Germany, Switzland, Japan and USA, such as CNC wire cutting M/C, CNC Machine Center CNC high speed Jig Boring M/C, CNC EDM M/C, CNC Optical Profile, three dimensional measuring instrument.... etc., to raise up tool production'sself control ability. Additionally, Auto-Stocking System for toolinq is also implemented. In order to increase production efficiencyjo reduce waste from manpower operation. We have worked out deeply and meditated with wide view, implementing ERP system, introducing AS/RS fully automatic stocking system and process distributing system. From material incoming, punching, and all different production process, assembly, till the finished goods, packaging, then shipping...., All processes have been included into this total intergrated system, fully computerize controled, enabling immediately and precisely control on stocking q'ty, delivering material to each work station just in time, first in first out, as well as production lot tracking.........etc. 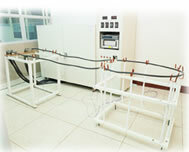 all can be checked and controlled effectively in the shortest time. All KST members have continued with their biggest efforts since many years, expecting to make KST to be an internationalized company. Facing the information explosion time, strong and big enterprises stand everywhere world wide, acquisition, merging, and strategic alliance is so popular in nowadays, it makes the bigger biggest and stronger strongest. Only continuously to improve company's constitution, raise up managing efficiency quickly and effectively; furthermore to strengthen R&D capability to meet customer's requirements, make all customers to treat KST as their own virtual factory; adequately, completely and quickly providing customers speedy service in all phases. Let KST become the terminal manufacturing center of the world, accomplish the final of "Running enterprise Forever" !! To meet and greet 21 st century, coming to an epoch of optical communication, KST has devoted into R&D and manufacturing precision ceramic, semiconductor, optical communication connector and the related components. 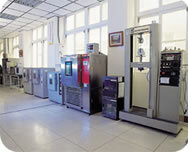 Presently, KST has controlled the precision processing processing technique of 4C Titianium thin wall products, tooling design and manufacturing capability, even more aggressively developing 4C's fine pitch precision connectors, and automotive, white goods strip terminals & connectors expected to become an international level professional manufacture.